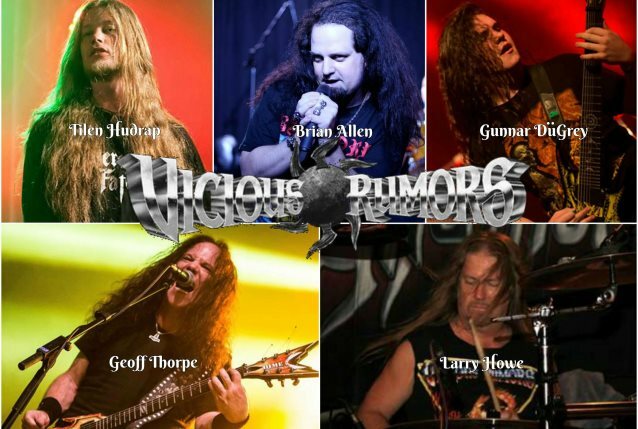 San Francisco Bay Area metallers VICIOUS RUMORS have welcomed back lead singer Brian Allen. Brian sang on the VICIOUS RUMORS albums "Razorback Killers" (2011), "Live You To Death" (2012) and "Electric Punishment" (2013) before leaving the band for family reasons. VICIOUS RUMORS guitarist Geoff Thorpe says: "We're so excited to have Brian back! Life really does have a funny way of coming full circle." Singer Nick Holleman, who sang on VICIOUS RUMORS' twelfth studio album, 2016's "Concussion Protocol", left the band to pursue other projects. Thorpe says: "With no bad feelings at all, we wish Nick all the best and thank him for four great years of recording and touring." VICIOUS RUMORS has also introduced a new lead guitarist — Gunnar DüGrey from Portland, Oregon. Only 18 years old, Gunnar is a world-class guitar player along the lines of virtuosos like Jeff Loomis, Vinnie Moore, Mark McGee etc. Thorpe comments: "His style, feel and general playing ability is out of this world." 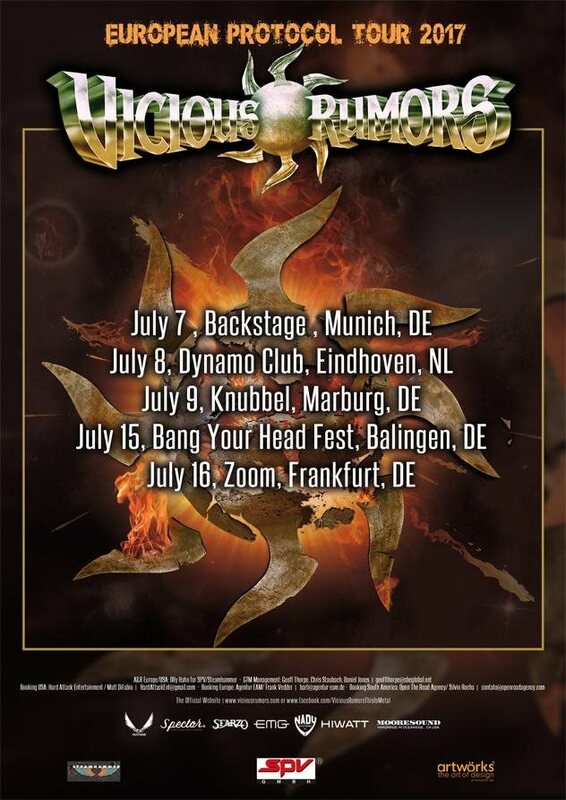 In the summer of 2017, VICIOUS RUMORS will perform an exclusive German open-air concert at the prestigious Bang Your Head!!! festival in Balingen as well as club shows. 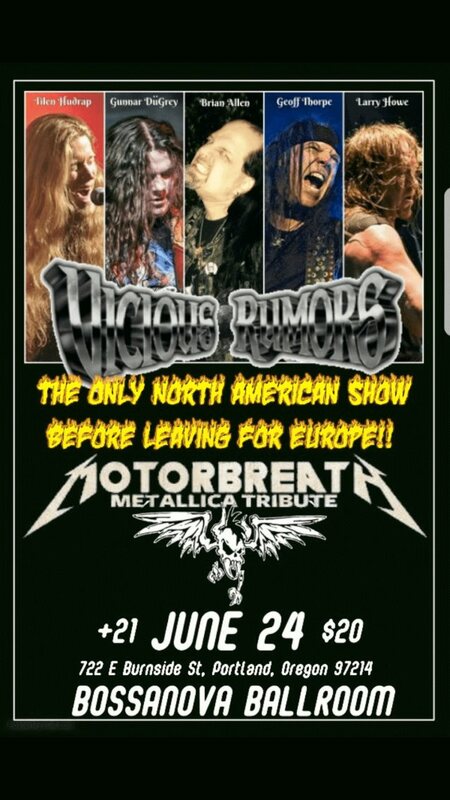 VICIOUS RUMORS returns to the legendary Dynamo Club in Eindhoven (The Netherlands), Zoom Nightclub inFrankfurt (Germany) with fellow bay area legends DEATH ANGEL. The band will also perform German headline shows in Munich at the Backstage and in Marburg. The only North American appearance is scheduled at Bossanova Ballroom in Portland on June 24. A full European headline tour is being booked by the EAM booking agency for November (exact dates and support bands will be announced in July), with much more to be announced soon.